Provita developed Hoofsure Konquest hoof gel in conjunction with Queens University Belfast and Roger Blowey. Konquest hoof gel is a concentrated blend of organic acids and essential oils. It is formulated to possess bio-adhesive and potent penetrating action so it sticks to the skin and hoof and effectively gets to the source of infection. 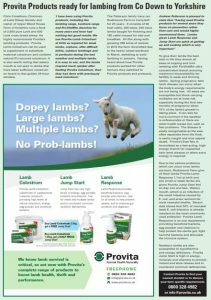 Provita have ongoing studies with Konquest hoof gel versus commercially available antibiotic aerosol sprays. Early results have been very promising. Cure rates are an impressive 75% after 28 day revisits for selected active DD lesions. For this study, Konquest was applied under gauze and lightly wrapped before removal in the parlour not more than 24 hours later. These early results are certainly encouraging and confirmed anecdotal results seen in the field from commercial users. We would like to thank all our customers for their business throughout the year of 2018. We wish you a very happy holiday season and a prosperous new year. Join us at the Eikon Exhibition Centre, Thursday 13th December 2018. Everyone is a winner at our stand EK50 with a prize to be one with every lucky dip entry. Hannah Shaw, Club Secretary of Spa YFC was recently selected for a YFCU Exchange in Norway. Provita sponsored her t-shirts for the trip.